Almost every time I read about transmedia lately, it’s about a large movie franchise is launching a mobile game, or how a major TV show is going to release a few webisodes. It’s all cool stuff that validates transmedia and cross-platform storytelling are here to stay and there’s no going back. But I’m worried that instead of validating transmedia, big brand marketing is what will define transmedia. Recently, everyone was buzzing about a short film Chipotle made about factory farming. When I clicked, I had to watch a pre-roll ad before watching Chipotle’s maudlin commercial that was advertising their mobile app, which I assume is designed to remind me to eat more burritos at Chipotle. Is this the future of storytelling? I don’t want the future of transmedia to just roll over and be run by the marketing department. I don’t want transmedia projects where the goal is to get to me to eat burritos. Independent transmedia producers love the challenge of telling a story across technology platforms, figuring out ways to incorporate fan-based media, and creating live-performance events. Simply writing a book or making a movie to send to film festivals seems… limited and a little boring. 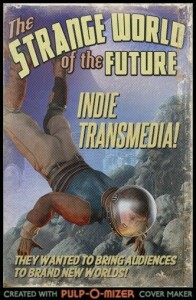 I truly believe people creating indie transmedia right now are the ones defining the format for the future. We can tell amazing stories in new ways that bring audiences together like no other form of storytelling can, or we can help sell more burritos. It’s time to stop being impressed every time a big brand labels their marketing as transmedia and it’s time to do more digging for cool indie transmedia projects. Better yet, it’s time to go make that indie transmedia project. UPDATE: Fiona Milburn introduced me to the Funny or Die version of the Chipotle ad, which is awesome and spot on.